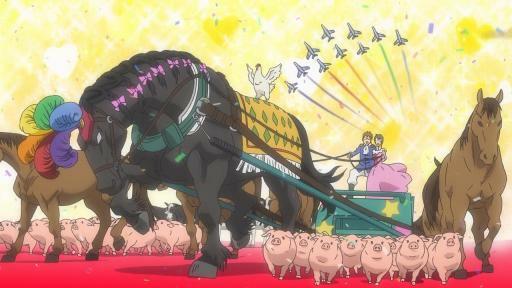 Of course, Silver Spoon was an anime about farming. 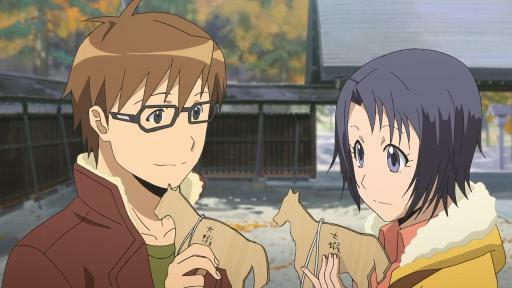 The anime took us far deeper into the agricultural world than we could ever imagine possible. Even more impressively, the show also had several ideas hidden beneath the farming stories (also read this post). Here I gave my general impression of both seasons of the show. At its core, Silver Spoon was a coming of age stories of a group of high school students. But instead of a regular high school, the story took place in an agricultural high school, where major parts of its curricula and extracurricular activities involved farming. To help the viewers get into the world of agriculture, the story was told from an outsider’s perspective. Hachiken failed in his previous school in the city and had problems with his family. So he chose to attend the high school far away from his home and his previous life. He basically ran away. The rest of series followed him through his daily life in the new world completely unknown to him. We watched him struggled, grew up and eventually rose to the new challenges. The anime was mostly episodic. Each episode focused on different challenge that Hachiken had to face, most of which were daily farming stuffs such as working with chicken, cows, riding horses, clearing trash, or baking home-made pizza. Typical events usually found in anime set in high school were all present; club activity, college planning, school festival, or visiting a friends’ house during summer break. As the series progressed, the audience learned more about Hachiken, his friends, and also a bit more about life. I had published a lengthy discussion about how watching Silver Spoon could affect the viewers’ lives here. 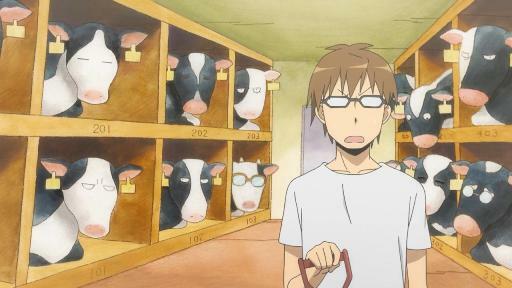 Despite its simple slice-of-life style and rather typical characters, Silver Spoon never ceased to amaze the audience with its in-depth exploration of the agricultural world. I didn’t know about other people. But for me, I never knew that making cheese and ham would be this complex and fascinating. Besides knowledge, teamwork and money, working with living things also required heart, respect, and even a bit of cruelty. The series did not shy away from mature or depressing side of things. It was made clear that in order to put food on the table, lives must be taken. And sometimes, the farmers had to weight those lives against other factors such as time and money. The greatest strength of Silver Spoon was probably its comedic moments. Despite its often serious or technical subjects, the series managed to keep things on the light note for most of the time. It was one of the funniest shows I’d seen, thanks to Hachiken and Inada. With all that said, Silver Spoon was not without flaws. The characters in this series mostly fell into familiar traits. Hachiken was actually an average good-natured high school protagonist we saw millions of time before. Komaba was the jock with heart of gold. Mikage was also a typical female lead, completed with kindness, intelligence, and looks. These characters were essentially flat and they were all very, very good people. Nevertheless, the show did not suffered much from this flaw. Silver Spoon did not give its character much complexity but, as I had discussed above, the situation around them were complex enough. As expected in this type of series, a few episodes suffered from minor pacing issues and unnecessary fillers. The ending might not provide the conclusive wrap up that many would expect. But I thought the show ended on a very realistic note. There was no miracle or knight in shining armor coming to rescue everyone from his or her problems. Life could be cruel, but not without hope. Everyone coped and moved on. These characters’ lives did not end when the show ended. So I believed that Silver Spoon gave me the best ending it possibly could. 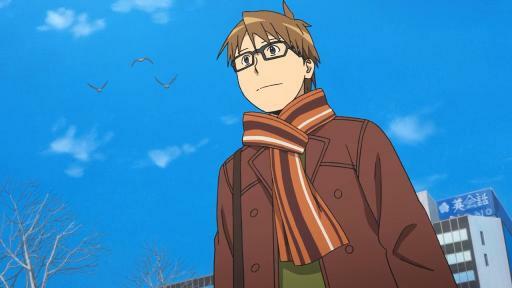 In conclusion, Silver Spoon was incredibly fun and interesting. The anime was also far more thought provoking than I had expected. Despite some minor flaws, I would still enthusiastically recommend it to fans of slice-of-life anime. This entry was posted in Series and tagged Silver Spoon. Bookmark the permalink. I’ve seen a lot of positive reviews for Silver Spoon, so it has been on my “to watch” list for a while now. I think it’s pretty impressive that a show about farming has managed to entertain so many people. Shame to hear about the stereotypical characters, though. I found the context surrounding the characters and their dynamic more interesting than the characters themselves. …It’s just me or the 7th cow on the left side is very suspicious?